WHAT IS OUR SKIN MADE OF? Our skin is also known as a cutaneous membrane. It is composed of two main tissue areas – the epidermis and the dermis. Underneath the cutaneous membrane is the subcutaneous layer – also known as the hypodermis. The epidermis is a lining made of several stacks of flattened cells called keratinocytes. New cells are produced in the bottommost layer and then are pushed upward. As they move upward, the cells become packed with a protective protein called keratin. The cells at the very top (the ones you can touch) are no longer alive, but they serve as a very important protective barrier between you and the world. One key function of keratinocytes is to prevent dehydration by restricting water loss from the skin. 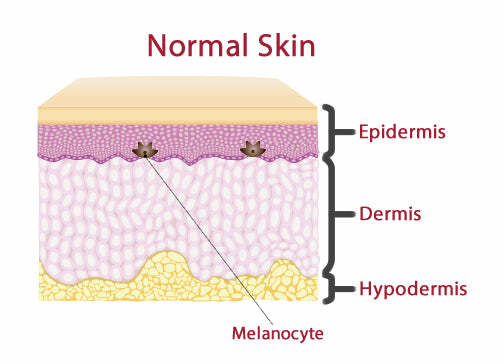 While keratinocytes make up more than 90% of the epidermis, you can also find melanocytes in the bottom layers of the epidermis. Melanocytes produce a pigment called melanin, which gives our skin its color. People with darker shades of skin have melanocytes that produce more melanin than people with lighter shades of skin color. Melanin actually functions to protect our skin from ultraviolet (UV) radiation emitted by the sun by absorbing it and rendering it harmless, so the more melanin you have in your skin, the more protected you are from the harmful effects of UV radiation. Blisters occur due to separation of the layers of cells that make up the epidermis or the separation of the epidermis from the dermis. Fluid released by the separation damage fills the space. 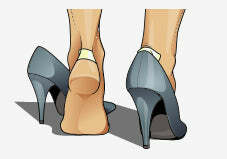 Blisters can be caused by friction (e.g. new shoes), extreme temperatures (cold or hot), and certain chemicals (e.g. the one released by the poison ivy plant). 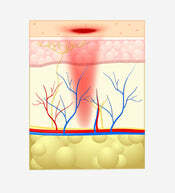 The dermis is an area of connective tissue that sits underneath the epidermis. 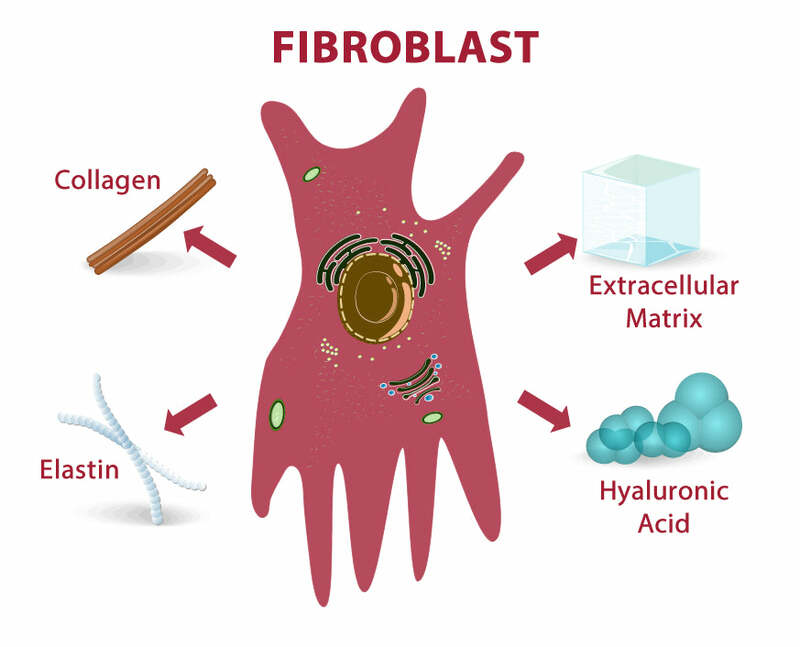 There are far fewer cells in the dermis than in the epidermis, but some of these cells (fibroblasts) produce important structural proteins that form the bulk of the dermis. Since these proteins are located between the cells rather than inside the cells they are called extracellular fibers and they form a network of materials that surrounds the cells called the extracellular matrix. The dermis also contains hair follicles, sweat glands, oil glands, nerves, and blood vessels. Collagen fibers are a very important structural component of the skin. They give skin its firmness and strength. The collagen fibers also play an important role during wound healing, helping to provide “tracks” for the repair cells to get to and from an injury. Elastin fibers are proteins that can stretch up to one and a half times their length and then snap back to their original length when relaxed (just like a rubber band!). Not surprisingly, elastin fibers give elasticity to the skin and they work together with the collagen fibers to keep skin firm: the elastin fibers provide flexibility to the skin, and the collagen fibers prevent damage to the tissue during stretching. Hyaluronic acid, a chief component of the extracellular matrix, plays a role in skin repair and it contributes to maintaining the correct consistency of the skin tissue. Hyaluronic acid also moves upward into the epidermis, where is plays a role in eliminating free-radicals and helping with the migration of the keratinocytes. The hypodermis is composed mostly of fat cells (adipocytes), although fibroblasts can be found here, too. There are some collagen and elastin fibers here as well, mainly acting as anchors to attach the skin to the underlying tissue. Some glands and hair follicles may extend downward into the hypodermis. This layer also contains larger nerves and blood vessels that the dermis, and the primary function of this layer is for energy storage in the form of fat. If you cut yourself and you bleed, then you have cut through the epidermis and at least as deep as the dermis. The epidermis has no blood vessels, so bleeding from a wound indicates the damage must be at least as deep as the dermis.